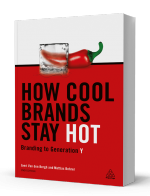 Want a free review copy of the NEW How Cool Brands Stay Hot? Earlier this week we announced the launch of the revised and completely updated How Cool Brands Stay Hot. We’re now eager to give away free copies of this new book to thank our loyal blog readers for their support and interest, but also to spread the word of course. How can you get one of these copies? Click here to send us your personal details. We are mainly looking for people interested in writing a review (either online or offline) on Amazon, LinkedIn, your own blog or any other media source or platform. The review action will be closed on March 15, 2013.